Today’s right-wing newspapers commit sins both of commission and omission. What they do and don’t say about economics today is very revealing. First, the omission. As Left Foot Forward reported yesterday, along with the Guardian, the Economist and others, the International Monetary Fund has published a report arguing that focus on cutting national debt rather than investment can do more harm than good. It said a bit of debt won’t actually hurt your economy, and will naturally be swallowed up by investment-led growth. Predictably, since this strikes to the root of the Tory government’s rationale for its economic policies over the past five years, (and for the five to come), the paper has been ignored by today’s right-wing print newspapers. Failure to cover the IMF report today is a real betrayal of the reading public. This is how the pro-austerity consensus on the economy is maintained, and used to justify government spending cuts. So to the sins of commission. What today’s press did do is cheer on chancellor George Osborne’s announced £3billion of ‘savings’, which include massive cuts to to health, education, local government, justice, welfare, and the home office. The Mail called the cuts ‘a first-class start’ to ‘clearing up Labour’s awesome financial mess’. 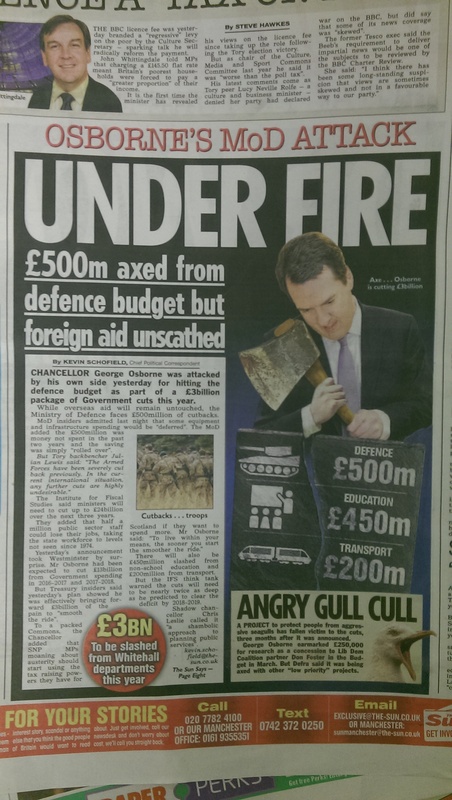 In fact, the only cut the papers seem to be upset about is the £500m cut to the defence budget. The Sun called the move ‘totally unacceptable’ and a blow to troop morale, while the Telegraph said ‘cutting defence spending could be a terrible mistake‘. The Express called the decision ‘disappointing’ and ‘crazy’ while foreign aid was increasing. The Sun didn’t even mention most of the cuts, reporting only £500m from defence, £450m from ‘non-school’ education and £200m from transport. Taken together, these two decisions by the Tory press involve the suppression of information of public interest, the promotion of one economic view above others, and a tight group think across most of the print media, with a view to controlling and influencing public opinion. Sign up for our weekly email by clicking here. This nation is not experiencing austerity, we spend vastly more than that we produce, and something like £150 m per day in useless interest. We will aim for a sovereign wealth fund instead of massive debt, then the people will look back aghast at the reckless days. The left wing press and BBC for years have ignored the very real toxic effects of mass i,migration, but that’s not suppression of facts of course. we spend more than we produce because we paid off the debt of the neo-liberal bankers who bust the world economy. Get you facts right about debt, before 2008 the debt was 38 percent of what we earned. The country loses £100bilion a year to dishonest big business who hide their profits off shore. What have you to say to that? is that OK then as long as the man and woman in the street stands the bill for them? I think we’re talking current-account deficit here, to which the bank bail-out did not contribute. And you’re muddling debt and deficit, like Ed Balls did. You’re right about multinational tax-dodging, though. The solution to that would be ‘unitary taxation’, i.e. taxing multinational corporations AS MULTINATIONALS (gasp, what radicalism!) instead of the current system of pretending that they are loose federations of independent national companies, each striving to maximise its own profit. They should file a single, international tax return. Profit for tax purposes should equal real profit, according to International Accounting Standards. 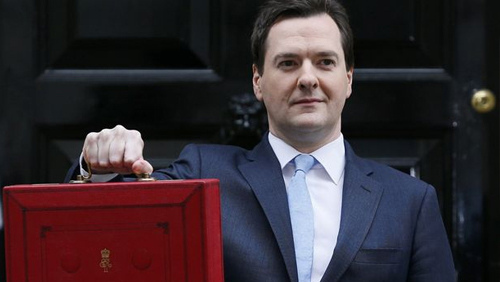 No mucking about adding X on, deducting Y, doing the hokey-cokey and shaking it all about. This global profit would be allocated to different countries according to a multinational’s economic basis in each country, calculated on, for instance, a mix of sales, non-financial capital invested and employee costs. Each country would then choose its own tax rate. That way, perhaps 0.001% of the profit would be allocated to, say, Luxemburg and they’d be welcome to tax it at 1% if they wished to. We’d still have to stop the multinationals spinning off semi-detached corporations that mysteriously made all the profits, or simply lying, but we’d be starting from a firmer base. no I am aware of what the deficit is- when a government’s total expenditures exceed the revenue that it generates (excluding money from borrowings). Deficit differs from debt, which is an accumulation of yearly deficits. Austerity is failing because it is not doing what the Tories say it is doing. The deficit remains high and the national debt is rising now and is heading for 85% of GDP by 2018. In 2007 the debt was just 38% of GDP, until the banking crash happened, It is this happening that has caused the problem. The government of Great Britain has spent £456 billion bailing out the banks money now being squeezed out of the public through an austerity regime. The Tories boast of producing 1.5 million jobs, a joke, because these jobs yield very little tax back the exchequer because they are mostly low paid. In other words they are next to useless in helping to pay off the national debt. I should have thought getting people back into work was a good thing in itself; and, of course, it can reduce benefit payments. Do you think the answer to our problems more spending, less spending, or the same spending? Why spending? This is the same old Tory bunkum, you mean of course borrowing. The answer is to make, compel by law, the paying of taxes on massive profits hidden by cheating big corporations defrauding Britain of up to £100 billion a year. Impose a Robin Hood Tax on city transactions and then “invest” in new industry. Return rail to national ownership and plough the profits into the country, not shareholders pockets, ” invest” in taking it back. Bring in a law as America did after the last great bank robbery in 1929 to stop banks ever doing what they did again. This was destroyed by Thatcher and Reagan and the outcome was the banking crash of 2007. Adam Barnet, this is misleading and you know it. are published to elicit comments and to further debate. You are trying to imply that this is the official IMF view. It isn’t, and you know it. It’s a discussion paper written by two individuals. Don’t just delete this comment, answer it. What have you got to say for yourself? Let’s keep repeating it. The recession was caused by bankers, not by the Labour government. If it was caused by the Labour government, why did much of the rest of the world have a recession too? If people haven’t got any money they can’t spend anything and when people don’t spend anything the economy contracts. It doesn’t take a genius who did a doctorate focused upon the ideas of Keynes and their successful application in the New Deal to work that one out. Stuff the Tory press they are duplicitous propagandists supporting economic policies that seemingly exist purely to enrich the richest and take away from the poorest, when will there be other than a Tory press? A few magazines, the mirror and the morning star is hardly going to create a tidal wave of popular political understanding large enough to wash away three decades of all pervasive Neoliberal propaganda and finally reach people’s minds in a way that can change the zeitgeist.